It's quick and easy to join the library by applying online. We’ll let you know when your card is ready for you to collect from your nearest library, or we can post it out to you. You can also join in person at any branch. If you live, work or study in Barnsley a utility bill, driving licence or bank statement. If you don’t live in Barnsley we’ll need to see two separate forms of ID showing your name and address. If you have just arrived in Britain, please bring your Home Office card. When we’ve seen your documents we can issue your membership card, for you to start using straight away. We’ll give you a temporary ticket that allows you to borrow up to two books if you haven’t brought ID with you. If you’re under the age of 16 you’ll need a guarantor to sign for you. This can be a parent or guardian. For young people aged 14 and 15 the guarantor may be another adult who is prepared to accept responsibility for losses and fines. You can become a temporary member of Barnsley Libraries if you’re already a member of another library elsewhere. Please bring your library card with you. You can use your temporary card to borrow up to two books at a time. Please return the card to us at the end of your visit to Barnsley. If you want to use our online library services, you will need a Personal Identification Number (PIN). You can call into any of our libraries with your membership card and another item of ID to ask for a PIN. Please tell us as soon as you can if you’ve lost your library membership card. 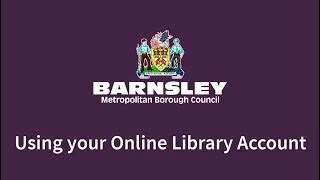 You can email barnsleylibraryenquiries@barnsley.gov.uk or call into your nearest library. Your first replacement card will be issued free of charge. Any further cards are charged at £1.50 for an immediate replacement. Alternatively, you can wait for one calendar month to have a free replacement. You will need to collect your new card from the library. Please tell us if you have changed your name or address. If you bring some ID into a branch, we can issue you with a new card straight away. By joining the library you’ll be agreeing to the terms and conditions of being a member. These are set out in our Library Byelaws document. If you’re using our computers you will also need to abide by our E Behaviour and ICT Guidelines.